Louise Sukle fell under the spell of newspaper publishing straight out of high-school. With no plan on joining the family business, she unexpectedly discovered a passion for newsprint when she was offered a part time job at the Press And Journal. She apprenticed with her mother, father, grandfather and uncle who inspired and nourished her appreciation for community journalism and newspaper design. In 1994 she and her husband Joe purchased the business and continued the family legacy. Together they expanded the business to include six publications and corresponding internet sites and a commercial printing operation, currently employing over 30 people. While she has performed almost every task at the newspaper (except for running the press) her first love remains design. An unapologetic print enthusiast, she loves nothing more than the anticipation of the next issue and the promise of new and exciting voices. Dave Brown is proud to be helping Press And Journal Publications build on a 160-year record of achievement that is nothing short of legendary. Since coming on board in 1999, he has played a leading role in adding several new publications: Woman Newspapers, Little Pink Pages, Central Voice, LGBT Pages and Caregiver's Guide in addition to managing sales for the weekly community newspaper, Press And Journal. With over 28 years of sales experience in a variety of industries including newspapers and special publications, Dave's unique qualifications have made him an excellent sales manager for Press And Journal's 5-person sales team. Dave is a versatile sales manager and client advocate and truly enjoys making connections and delivering unparalleled customer service. Julianna Sukle is an award-winning and highly skilled multidisciplinary designer & art director with over 15 years of experience in the field of graphic design. Julianna has worked the gamut of clients (Guggenheim Museum, Ralph Lauren, American Cancer Society & NYC’s 92nd Street Y to name a few) and although her skill-set is vast, her greatest expertise revolve in the worlds of brand identity design, content creation, social media, interactive design and print collateral. She also loves false eyelashes and caffeine. Like you, Tina Rinehart wants to live in a world where what you do makes a difference. She believes her job isn’t about selling advertising space. Rather, it's about what advertising can do for her clients. As advertising representative for Woman Newspapers and Little Pink Pages, Tina works closely with her clients to achieve a common goal: to build business and brand image. Her remarkable 20+ year career has always involved sales, marketing and customer service. What distinguishes her from others in her field is that she often takes on roles outside of her normal job duties and provides support to her clients. On her own time, Tina lives in Middletown with her husband, youngest son and a ragtag family of adorable canines. Deb advocates for women's breast health, and writes about surviving breast cancer and every day life. She's writing a book about her years as a young airman working with the USAF Thunderbirds. She holds an MFA in writing from Pacific University. She's the proud mom of two adult children, and two rescued dogs. Although Deb lives in Cypress, Texas, she still dreams of her native Pennsylvania's rolling hills and cut-away fields. Deb's Mom and cousins live in Harrisburg. Deb's been writing for Woman Newspapers since 2008. Kelly Sangree is a wife and mother of four who lives at the edge of Harrisburg. She enjoys riding bikes with her family and encouraging other families to ride together through Recycle Bicycle Harrisburg (recyclebicycleharrisburg.org). 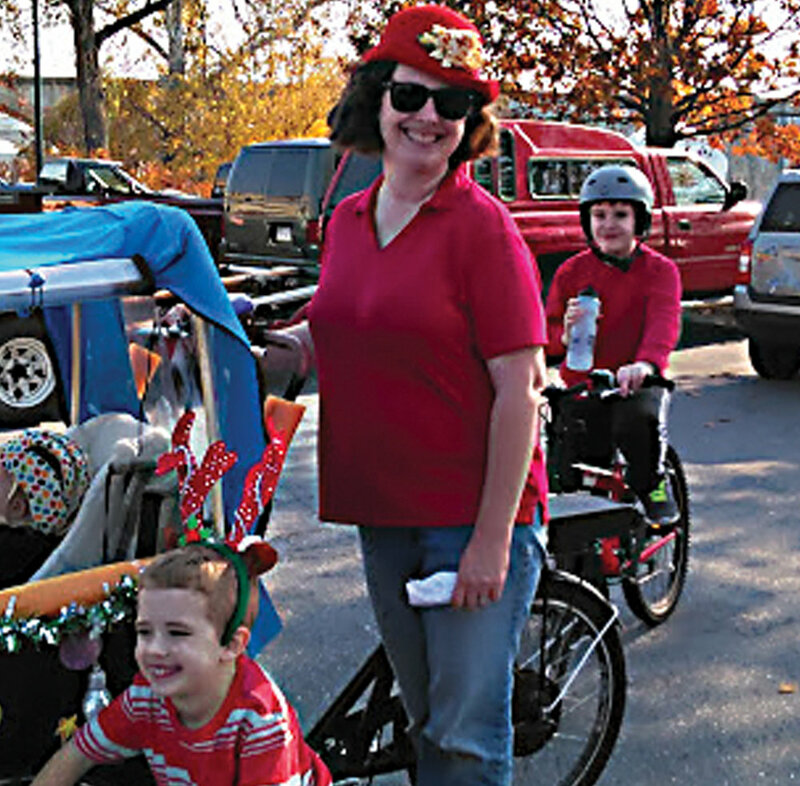 Watch for her and her odd bikes as you ride through the city! Brenda is a graduate of Harrisburg Area Community College, and works full-time outside of the writing world. Always looking for that silver lining, she gave birth to her first six pages of “serious” writing while on hold during a phone call to the unemployment office in 2011. She has freelanced ever since, and in addition to her column in Woman, has been published in the Hummelstown Sun, The Patriot-News, and Wisdom-Magazine.com.